HWPH AG - Acciones antiguas - Flight International Group, Inc.
Ohne Datum, ca. 1982, Specimen eines Zertifikats über Shares á US-$ 0,01, o. Nr., 20,3 x 30,5 cm, grün, schwarz, Perforation, lochentwertet. No date, ca. 1982, Specimen of a certificate for Shares á US-$ 0.01, o. Nr., 20.3 x 30.5 cm, green, black, perforation, hole cancellation. Die Gesellschaft bot Dienstleistungen in der Luftfahrt an, vor allem Trainings in speziell umgebauten Flugzeugen. 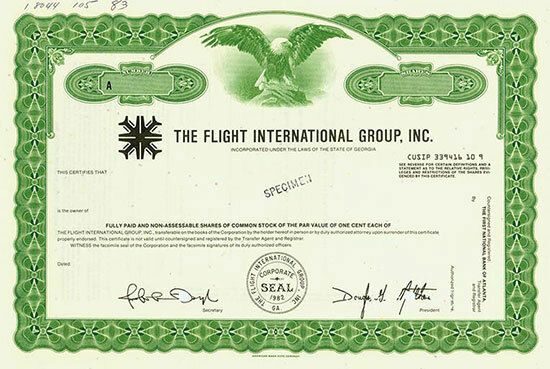 Flight International Group, Inc. was an aviation services company. It performed military training services using specially modified commercial aircrafts.